It's Saturday Morning. The one morning of the week which defied all kid logic. You wanted to get up as early as possible. There were cartoons to watch! And as we all know - with only three real television stations (ABC=21, CBS=15, NBC=33) - we only had about four hours of real cartoon-watchin' time! In honor of Saturday mornings, I pledge to feature here weekly - on Child of the Fort - one of those cartoons that we all used to watch back in the day. 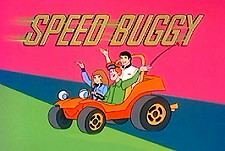 Speed Buggy was a Saturday morning cartoon produced by Hanna-Barbera Productions from September 8, 1973 to August 30, 1975 on CBS. Similar in style to Hanna-Barbera's successful Scooby-Doo, Where Are You!, Speed Buggy followed the adventures of an anthropomorphic, fiberglass Dune Buggy, Speed Buggy (voiced by Mel Blanc), his driver Tinker (voiced by Phil Luther, Jr.), and Tinker's friends, Mark (voiced by Michael Bell) and Debbie (voiced by Arlene Golonka). The three young adults and their car traveled from race to race, often encountering spy capers and mysteries along the way. Speed Buggy's trademark quotes were always "Roger-Dodger!" and "Vroom-a-zoom-zoom!" Though Speed Buggy (nicknamed Speedy by his friends) had a mind of his own (which was based on Disney's Herbie the Love Bug), he was vulnerable to commands given through a communicator/remote control device made by Tinker when he first built Speed Buggy. Speedy's friends rarely used the device to control his actions, using it mainly for its communication function, but criminals and other ne'er-do-wells would sometimes steal or duplicate the device and manipulate Speedy for their own purposes. Sixteen 30-minute installments of Speed Buggy were produced in 1973. The show was a such a huge success that it aired on all three major networks (CBS, NBC and ABC) until 1979, then was picked up for syndication until 1983. Most likely due to the shows inspiration, Scooby-Doo, Where Are You!, the character Tinker shares many visual likenesses to Scooby's beatnik best friend, Norville "Shaggy" Rogers. Also, there are some similar character traits between Mark and Fred Jones, and Debbie appears to be very similar to Daphne in multiple ways. Oddly enough, I was discussing Speed Buggy with visiting in'laws the night before you posted this. .. I DON'T LIKE SPEED BUGGY. I miss those cartoons back in the day. Gotta love 'em classic cartoons like Speed Buggy. Oh, you've mentioned Scooby Doo, right? Has anyone noticed that the guy in the jumpsuit looks like Shaggy? Haha! Oh, I didn't like Speedy Buggy as a kid. But I loved cartoons and enjoyed many hours playing with my toy cars. I always thought Scooby Doo's and Batman's car were better. Hehe.